Falcon Lodge Methodist church is on the Falcon Lodge Estate, which was built between 1948 and 1956. Before the Second World War Sutton Coldfield Corporation had acquired the land occupied by Falcon Lodge House which had been built on newly enclosed common land in 1820. The estate and surrounding area is served by several local Christian churches including St Chad’s (Anglican) on Hollyfield Road; Falcon Lodge Methodist Church on Newdigate Road; Falcon Lodge Chapel (Evangelical), Reddicap Heath Road; Holy Cross & St Francis (Catholic), Springfield Road. The first Methodist Evening Service was conducted in the newly completed Falcon Lodge Community Hall on Sunday 8th January 1956. The collection amounted to £4.4.0d! Previously, several people had met in their homes and on Sunday afternoons several children went to South Parade to attend Sunday School. A few weeks later our own Sunday School soon started in the Community Hall and within months the number of children registered was over 200. The church building containing the worship area and two other rooms and a kitchen was opened and dedicated on Saturday 2nd April 1960 by the Lady Bennett JP and was dedicated by the Chairman of the Birmingham District the Rev. W. Russell Shearer MA. Uniformed organisations met in the Scout Hut on Lingard Road behind the church. A Youth Group met on the Church premises during the week and in homes on Sundays after the evening service. On March 17th 1967 Lady Bennett returned to our Church to open the new church hall (now known as Room 1). There was a short service conducted by Rev K. Richardson and tea was served in the new hall for the 200 people who attended the service and dedication. 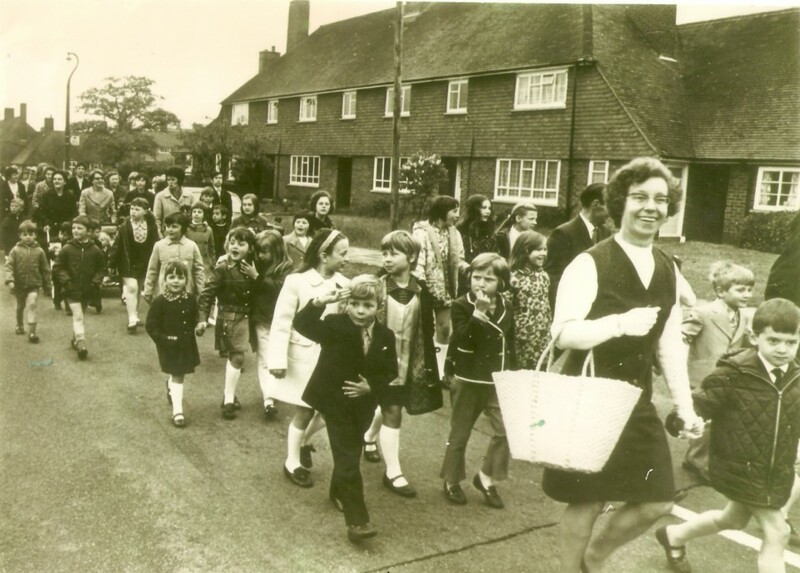 We have regularly joined with St Chads and Falcon Lodge Chapel for processions of witness around the estate which, in the past, started from Newdigate Playing Fields. The photograph below left shows a walk of witness on Churchill Road. 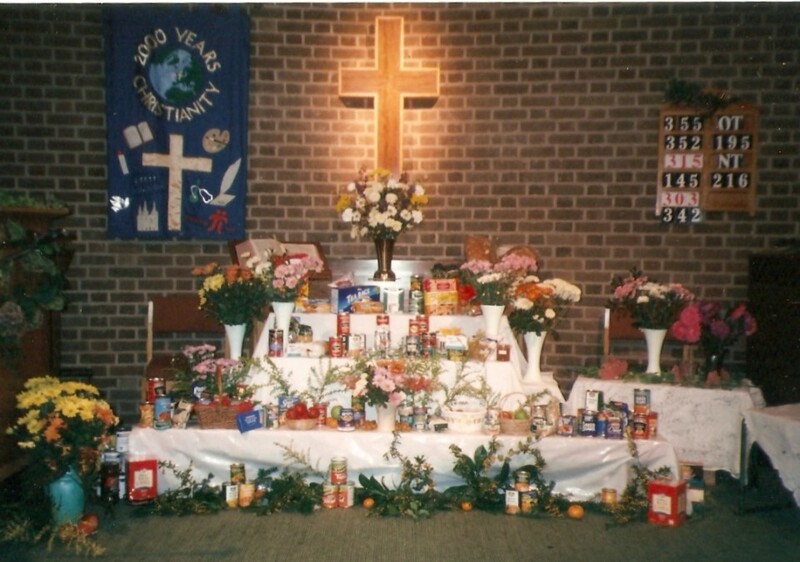 Harvest celebrations are a key aspect of our church life and the photograph below shows a typical display of produce which we donate to St Basil’s in Birmingham city centre. In 1976 Morning Worship and Junior Church were retimed to 10.30 am and we continue to meet for worship every Sunday at that time. In 1983 the Church formed a group to study the problems of and to provide facilities for unemployed people on the estate. In 1985 Pastoral Visitors were appointed who regularly visit Church members and friends and the church enjoyed the Silver Jubilee celebrations. 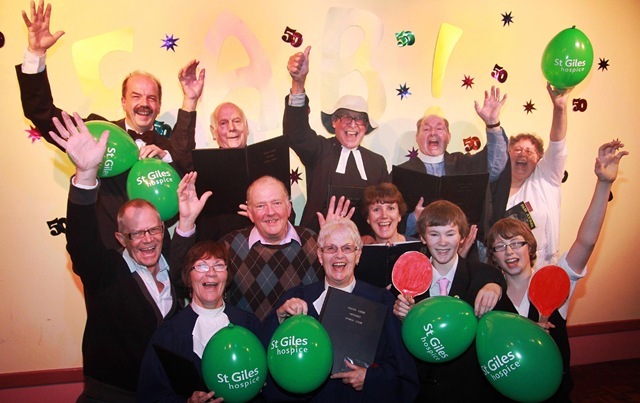 Up until 1998 we sang Carols in Gracechurch shopping centre in Sutton and for the last 40 years have sung carols around the streets, raising funds for Action for Children. 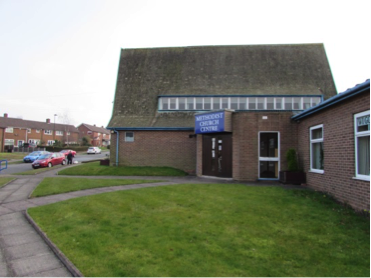 From its opening in 1966 until closure in 2012, the Church conducted a weekly short act of worship in the Heathway residential home on Reddicap Heath Road. Following an application to Sutton Coldfield Municipal Charities the Church was granted the sum of £36,000 in 1995, subsequently increased to £60,000 in 1997. The sum enabled the church to extend and refurbish the kitchen and install children’s toilets and a toilet for the disabled on the lower level. The extended premises were opened in September 1997. Funds had been raised by church members to supplement the grant. As a condition of the award of the grant was for the premises to be available for use of the community, Lodge Lunches opened on Wednesday 6th May 1998 and ran weekly until December 2013. Lodge Lunches reopened on November 19th 2014 to serve meals on the third Wednesday of each month. In 2008 and 2010 we hosted Christmas Tree Festivals over a weekend in December. Over 40 trees were displayed by church members and friends, and groups from the Falcon Lodge community. In 2010 we celebrated our Golden Anniversary with a number of events. A number of previous ministers returned to lead worship on Sundays. We enjoyed a reunion tea party in May, a celebration meal in July and the ‘Falcon Anniversary Bonanza’ Church Concert on Saturday October 9th 2010 which showcased the performing talents of many church members (as shown in the photograph below).